Perfect Moment Monday is a monthly blog hop/writing prompt, sponsored by Lavender Luz at Write Mind Open Heart, about noticing a perfect moment rather than creating one. Perfect moments can be momentous or ordinary or somewhere in between. On the last Monday of each month we engage in mindfulness about something that is right with our world. Everyone is welcome to join. When my son was old enough to start attending birthday parties, I was a little bit appalled at the kinds of birthday parties being thrown for the preschool and kindergarten aged set. I felt lucky when he didn't complain about a party-in-the-park that turned into a big-playdate-at-our-house due to rain one year, and when he asked, at age four, for an "adults-only" celebration. Last year, we celebrated more traditionally with a space-themed party at our house, but, type A person that I am, I spent months planning and preparing. When we asked him what he wanted to do for his birthday this year, he told us that he only wanted one person at his party: a little girl who has been his friend and constant companion since he was a toddler. We love A. She has the impish grin of an elf, but the seriousness and thoughtfulness of a much older child. She insists on wearing dresses, but also on climbing trees. They met when my son went to Montessori school, in the Toddler House, where they spent hours together, since both sets of parents were working full time. When they moved up to the Primary level, they went to separate classrooms, and were thrilled when those classrooms had to be combined due to some downsizing at the school. The teachers joked that they were inseparable. I. and A. talked about getting married, about buying a house at the beach, about how many cars and campers and tractor trailers they were going to have. It was sweet. And yet, maybe a little too sweet? I wouldn't say that we tried to dissuade him from his "party for two," but we gave him every opportunity to renege on the decision. I worried about what her parents would think. What about your other friends? we asked several times over the next month. What about the boys? Every time, he shook his head. No, he'd say, firmly, I just want to have A. over. Finally, he became annoyed, and said, in that unmistakeable teenager-y voice, "Mom, haven't you been listening to me?" Well, I had. But I hadn't. I. 's birthday would be early in his first year in a new school, in a class full of people he didn't know. Of course he wouldn't feel comfortable inviting any of those new people to a party. And maybe he felt like he just wanted something quiet, and familiar: the companionship of a friend whom he hadn't seen since camp ended, and whom he wouldn't see again for many months. I. 's birthday was a perfect fall day: warm but not hot, breezy without the chill. A. arrived at mid-day, dressed in blue flowers, and I chauffered them both downtown in the MegaWagon. We ordered one prince and one princess tea, and they chatted and giggled over banana-nutella sandwiches and strawberries and scones while I tried to eat my salad as inconspicuously as possible. The staff came out with a candle-adorned cupcake in the middle of generous plates of desserts, and sang happy birthday, as I. beamed, and his companion looked on, grinning broadly. When tea was over, they went browsing at the adjacent shop that sells all things porcelain, and conspiratorially ran ahead of me back to the wagon. It was hard going on the way back, since I'd drunk an entire pot of tea by myself, and I made the usual adult groaning noises, which they thought were extremely funny. Finally, about three quarters of the way back, they decided to pull the wagon together up the hill to our house. And as I walked behind them, feeling the warm autumn sun on my face, I thought about the beauty of uncomplicated friendships, of the completeness of children's love, and felt grateful both that I. has a friend like A., and that he recognizes what a gem she is. I felt glad that he didn't feel the need to have a big party in order to feel celebrated, and lucky to have a little boy who has already figured out what's really important. 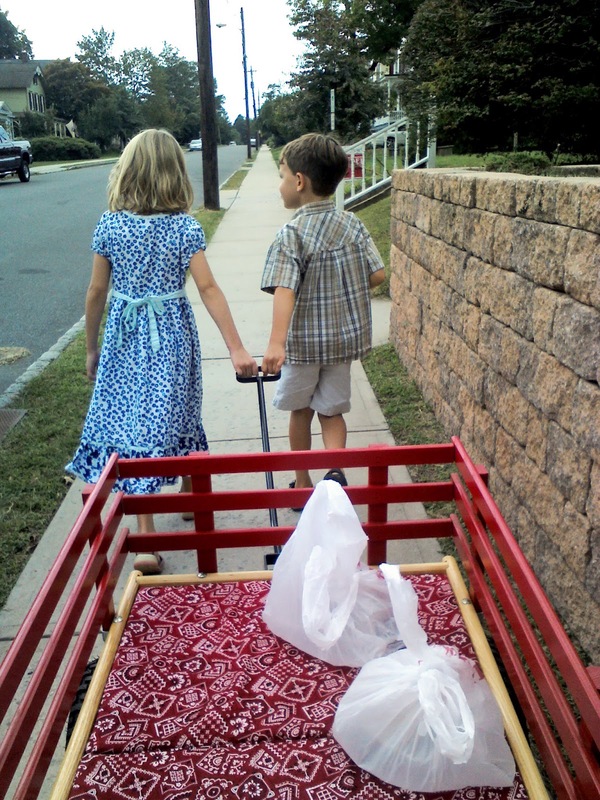 At one point, I was struck by how perfect it was, watching them walk together, and I snapped this picture with my camera phone, I hoped that they would always remember that first friendship, and remember how it's easier to pull a really large wagon when you're both holding on to the handle, bodies close together, talking, laughing, wondering about the world, and not paying attention to how heavy it is. It's a lesson we would all do well to learn. Happy birthday, I. May they all be as perfect as this moment. 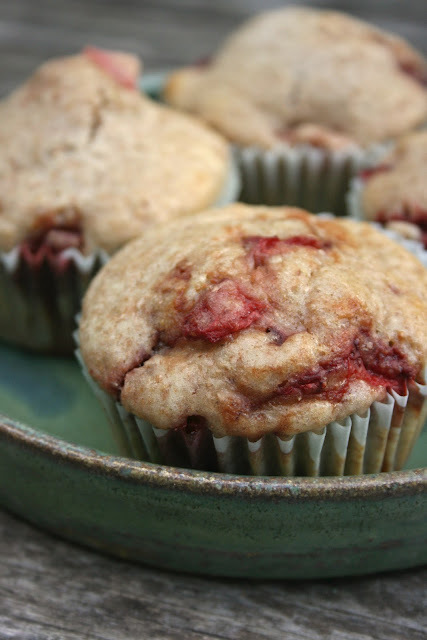 These healthy muffins are perfect for a lunchbox, a snack container, or children's tea. Or maybe for you, to share with a friend. Mix together dry ingredients in a large bowl. Separately mix together wet ingredients. Make a well in the dry ingredients and add the wet ingredients. Stir with a wooden spoon until just moistened ... do NOT overmix! Add the strawberries and stir gently until just combined. Pour into 12 muffin cups and bake 12 minutes at 400 (or 13-14 minutes at 375 if using agave). Truly something special, like a montage at the beginning of a movie that pulls at your heartstrings. I'm so glad that you noticed and captured this moment of sweet simplicity, of awareness that one has enough of the important things. What a special boy you have, and what a special friend he has. So lovely. Also, I have a big tub of frozen strawberries and a 4-year-old's birthday coming up. What a nice, peaceful birthday party! I'm so glad he has a friendship like this, that he'll treasure forever. Oh no, more muffins for me to make? Well, at least *I'm* not sick of them yet! Love this! What a great story of your son's birthday celebration with his special friend. I wish more kids were like him when it comes to imagining their parties. My son's birthday also falls early on in the school year and for the second year in a row I am inviting the whole class to his party. Last year I did a neighborhood scavenger hunt and other parents stayed and led small groups of kids. This year we are having a gathering where he takes Tae Kwon Do, which should be fun. But next year we will likely try to go smaller and I appreciate how low key has a lot of merit. Anyway, those muffins look yummy and as usual your story telling here made me feel like I was right there with you experiencing it all. I would love to go to tea with you someday. A very happy belated birthday to your son! What a beautiful moment. And what a charming little boy. ;) Happy Birthday I.! Thank you for sharing. I am truly choked up. What a wonderful boy you have. Such a lovely post. I am sure that my parents spoiled me with birthday presents. I have vivid memories of waking up to mounds of wrapped presents on my bedroom floor (we did not do presents at any other time of the year for religious reasons so my mother always felt like she was making up for Christmas and Hanukkah, etc) but the only present I can remember clearly was seasons tickets to the traveling Broadway shows about an hour from our house with my best friend (it was her birthday present too). I think we went to 4 shows over the course of a year, with our moms alternating as chaperone. I loved the dressing up, the adventure, but I also remember loving the idea of looking forward to a year of Sunday afternoons with -one- friend, the type of friendship that so easily ends in middle school (as ours did the following year). I hope you find ways to help your son maintain this friendship despite not seeing his friend in school every day. Gorgeous post, all of it. What a sweet little man you have! I loved this post - truly a perfect moment for all of you and that photo is really beautiful. That is a beautiful story. I hope they stay friends for a very long time. I love this. how sweet that your son has such a wonderful friend and doesn't feel pressure to do the big party thing. I love it! lovely photo too. I also love how your recipes include options for agave (and all the necessary adjustments) as well as milk and egg alternatives. so hard to find all in one place! I may try these this week when it's our day to bring snacks for preschool. thanks! Hi from ICLW...those muffins look YUMMY!!! I love this! What a wonderful birthday with a special friend. I would love to go to tea with you too; I can't wait until D is a bit older and I can take him to a teahouse. Love it!! My oldest son just turned 13. He was and is the same way. And like you, I don't know why I have tried to dissuade him from such decisions. So wonderful to have a child who knows who he is and what he wants. What a perfect birthday. Just love the picture pulling the wagon. Lovely, lovely, lovely. Lovely story, lovely photo and lovely friendship. And good for I for marching to his own beat. It sounds lovely...and the strawberry muffins sound yummy! This is good to see that your kid has not complaint you about the party but i think kid deserve a grand kids birthday party Boca Raton. And every parent must try to manage the best party. So special. I love parties and friendships like that.